Auburn lost to LSU Saturday night. But that doesn’t necessarily means they won’t go undefeated, at least not if LSU gets convicted in the press of paying players and Auburn applies the same standards of defeatedness it used in 1908 (you gotta believe). 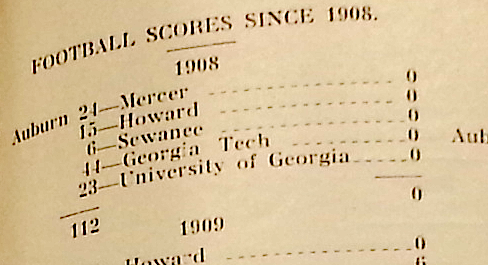 That year, 1908, Auburn lost one game, to LSU. Or rather Auburn played a football game against LSU in Auburn that ended with Auburn having only scored two points and LSU (which had been bowling over teams by 30, 50, and 80 points) having scored 10. They were the only points scored on Auburn all season. You can call that a loss if you want, but do consider that on average, LSU’s players were 20 pounds heavier than Auburn’s. And that almost all of them had Yankee accents. And that—wouldn’t you know it—almost all of them were being paid. Late in the year, legendary sports writer Grantland “He’s No O.B. Keeler But Who Is?” Rice wrote a story alleging that several LSU players were professional, northern imports from other schools, some even playing under assumed names. The resulting S.I.A.A. investigation (conducted a year later) didn’t turn up enough evidence for the conference to do whatever they did to cheaters back then. But 1908 LSU star (and object of Auburn ire) Doc Fenton (whose father was a snake oil salesman) admitted as much years later (implicating Mississippi State as another seeker of his illicit services in the process). Fenton fondly recalling the $70 worth of new clothes procured from the Progressive-era, Baton Rouge equivalent of T-Town Menswear in order to make his transition from tackle, his preferred position, to quarterback more palatable. Whatever the reason, the Tigers owned the crown. They owned it hard. But Auburn eventually took the justice-seeking a step further, straight up erasing the game from the loss column (at least for a time—it’s been back for a while) to the point that 1908 was actually included among Auburn’s undefeated season retrospectives published years later in issues of the Auburn Alumnus. After all, we’re talking college football, right? 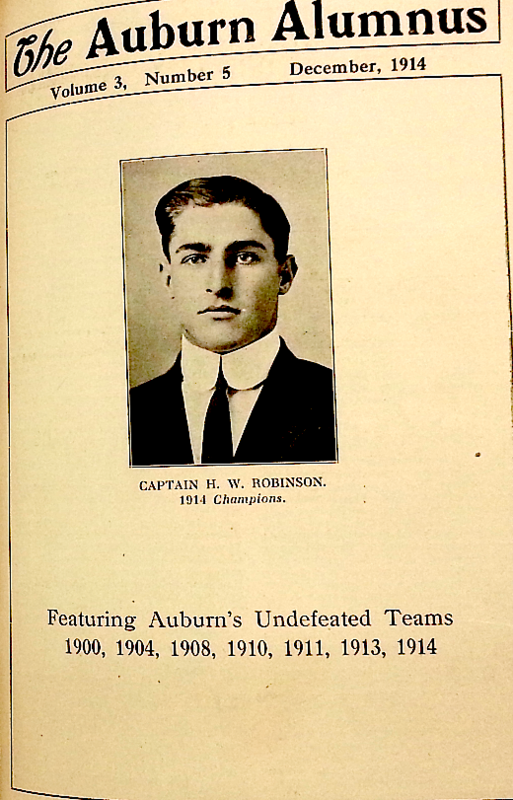 Related: The time an Auburn fan coldcocked an LSU player with a cane, and other fun stories of violence from the 1908 Auburn-LSU game that wasn’t. “Progressive-era, Baton Rouge equivalent of T-Town Menswear” – Classic. Da’ye gott’s ta go’es reeel reeel deep in da’swamps fo’ dem’s big ol’e boy’s @ LSU. Da’momma’s don’ts start’em in da’firs grade ti’ll dems a’bouts nine o’ten. Do’s AU boys is only 19/20, dem’s LSU guy’s fulls grown men 24/25 !!! !